"Anchorage Earthquake Damage - 1964 "
B>(1759) POSTCARD: Anchorage Earthquake Damage - 1964 -Condition: Very Good.- Not Posted. 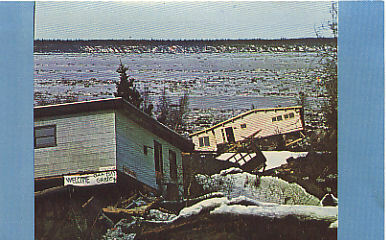 Photo of the Turnagain Residential Area overlooking Cook Inlet, with significant damage due to the 1964 Earthquake in Anchorage, Alaska. The Earthquake hit on March 27, 1964 (Good Friday) and is the most powerful one ever recorded in North America. Price: $4.50 + shipping.